Hey, guys! I'm back being active and throughout the week, my mind came up with serious ideas for my novel. (yay) I'm going to apply to them soon, let's to say that I don't end up procrastinating my time away. Anyway, I've finished reading this book for a week now but I think I still remember how the story goes. The beginning of the story went smoothly and I enjoyed reading the first chapters. Jacob returned, now keener than ever, to steal Bella's love away from Edward. Edward keeps his cool while Bella tries to third-wheel herself or set things right to no avail. Well, he's a teenage jerk, give him that. Edward is like what? A century-year-old? Classic teenage love-triangle drama. I give it a thumbs up. :D I would give it a bigger thumbs up if Bella actually did something rather than moaning about this problem. Sheesh, she could at least tell Jacob to fuc see somebody else right? My first problem in this book (which I hope there wasn't 'cause I liked the beginning) is when Bella visits the Quileute tribe to hear their stories. Well, dedicating one chapter to backstory for suspense-making is fine actually. Two chapters later, another long full chapter backstory about newborn vampires for more suspense-making. Fine, too, except... it was boring. The whole part was dull and draggy and completely felt like the book was trying to make itself longer. Still, it was okay, actually. Because I got to know stuff I didn't know. Jacob and Edward's love-triangle with Bella (let's not talk about the girl not doing anything, okay?) is a strong conflict. I love how Meyer manages with this all through the time. But when the three went to the woods before the big war between newborns and the coven + tribe, it was a horror. Jacob and Edward argued while Bella was half-sleeping like children. I mean, what with the name-calling only ten-year-olds would do and ridiculous tantrum throwings and vows? This is melodrama! And it does not fit! Also, let's not forget Bella moaning about Edward and Jacob not to hurt themselves when she definitely knows they aren't as vulnerable as she is. We get it, Bella; you don't want them hurt. But later, Jacob got hurt after the battle. Bella, you freaking jinx. 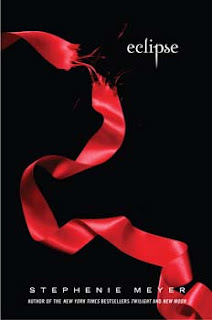 All in all, this book is better than New Moon but not as good as Twilight. I still am waiting to read Breaking Dawn to conclude this series. In the meantime, I'm almost finished with Empire of Storms. I can't wait to write the review of it too. I also can't wait to apply all my ideas into my novel! Alright, thank you for reading my review. Be sure to check out the other reviews! See you in the next post, soon! Check out all the other book reviews here!